In the time since my last post, I have been living in my new house in Kenilworth (which is very nice). I have had a bad cold after my long summer trip, I have had a training camp in the Ukraine with the GB squad (maps and photos to follow), I went to the Post Finance Sprint in Switzerland (where I did very badly) and I am now in France at the World Cup Finals. These are being held in the Auvergne region, close to Clermont-Ferrand. The event website is here. Most of the team arrived on saturday, but the Post Finance Sprinters drove over from Bern on Sunday morning. We all took the opportunity to go to the model events to get a feel for the very special terrain (see extract below). 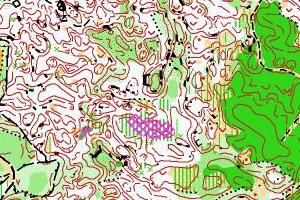 We were blown away by the technical element of the orienteering here - it truly is a case of lose contact with the map, and lose the race. Mistakes here can be measured in tens of minutes. I had a solid race, no big mistakes. I stuck to my plan which was to keep constant contact, make good judgements about where to run fast and where to really concentrate, and if in doubt, make absolutely sure. I made a small mistake early on, and really hesitated at one control where I stood still for over 30seconds making absolutely sure that I was where I thought I was. At the end, I was running at a really good pace with a small pack and I qualified comfortably. I feel that I was a little unlucky in terms of heats, as my time would have placed me much higher in the other 2. I felt 12th was worse than the run deserved. Results here. The map of my race is here. Memorable. Before the race we knew it was going to be trickier than the qualifier, with less paths, more details and more climb. What we didn't know was that the weather would conspire against everybody and force the race to be cancelled. Winds over 100km/hour knocked out power to the whole region and caused many trees to be knocked over. The event itself lost power and runners were stopped in the forest. Only a handful of athletes finished the race, and many weren't even allowed to start. I started, but only made it as far as half way to the sixth control before I was stopped. My run was ok, I had made a 2 minute mistake, but apart from that I was fairly happy, even catching Audun Weltzien by 8 minutes (at the 2nd control). Tomorrow is the sprint race, I have a fairly late start. Then thursday is the classic, friday the rescheduled middle and saturday the relay.